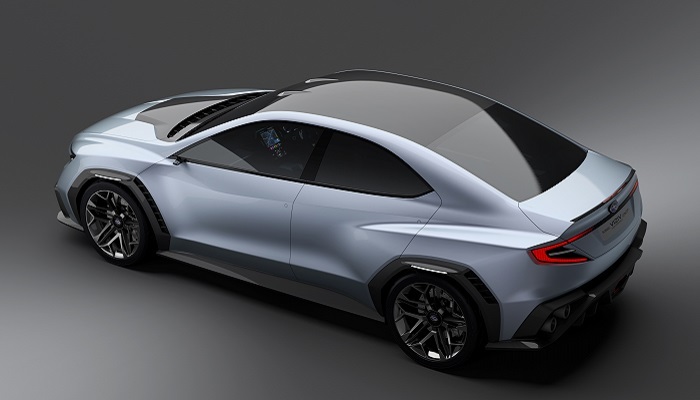 Subaru today unveiled its VIZIV Performance Concept at the 45th Tokyo Motor Show. The first sedan body of the series, the VIZIV Performance Concept symbolizes superior Subaru driving performance and the Symmetrical All-Wheel Drive (AWD) layout, powered by a Boxer engine honed over more than five decades of development. In sports sedan form, it conveys the concept of driving enjoyment that Subaru continues to pursue. In anticipation of widespread future deployment of automated driving technologies, advanced driver assist functions, combining the next generation EyeSight®system with other devices, are installed. The VIZIV Performance Concept draws inspiration from previous production models symbolizing the Subaru driving experience: the Legacy (Liberty in Australia), which defined Subaru as a driver’s car, plus Impreza and WRX, which took the World Rally Championship by storm. Based on Subaru’s “Dynamic X Solid” design philosophy, this next-generation sports sedan encapsulates driving enjoyment. Driving performance is highlighted by a low centre of gravity, the dynamic flare of the guards, use of carbon fibre parts in the bumpers, guards and roof, and the glimpse of the exhaust in the rear bumper. The three-dimensional form of the front grille is flanked by hawk-eye headlights while the muscular guards point to the reliability of Symmetrical AWD. Subaru has teamed advanced driver assist technologies scheduled for launch around 2020, with the high performance offered by the Boxer engine and Symmetrical AWD - creating a sports sedan symbolizing the “Enjoyment and Peace of Mind” expected of its cars. By also incorporating further enhancements to EyeSight driver assist technology, radar and highly accurate GPS and navigation systems, Subaru continues to pursue the ultimate levels of safety, aimed at eliminating accidents. Also unveiled in Tokyo was the BRZ STI Sport. While on-sale only in the Japan domestic market, some elements will be included in a yet-to-be disclosed Australian variant, which will be on sale around end of year. The new range-topping variant in Japan has been jointly developed with Subaru Tecnica International (STI), to achieve new levels of driving performance, quality feel and luxury. The suspension features flexible V-braces and flexible draw stiffener front suspension. Exclusive 18-inch alloy wheels and high-performance tyres are used. The ZF-made SACHS shock absorbers, and coil springs specially tuned by STI, improve steering response and suppress roll - achieving flexible but highly stable driving performance. The exterior is highlighted by an exclusive front bumper and adopts glossy black components, emphasizing strength and superb driving performance. The interior colour motif is unique to the variant, featuring Bordeaux red coordination. Quality materials include genuine leather and Alcantara® seats. Exclusive components are used for the instrument panel and its glare shield, and for the steering wheel, creating a sporty and special space.